Schaumburg, IL – September 24, 2018 – On the eve of Labelexpo Americas opening in nearby Rosemont, INX International Ink Co. (booth 121) has announced two promotions involving the Research & Development department. Mark Hill and Jonathan Graunke have new assignments and will work closely to take INX’s state-of-the-art Research & Development facility to a new level. Hill is now Vice President, R&D Director and Graunke has added the title of Assistant Research & Development Director to his current responsibilities as Vice President, UV/EB Technology. 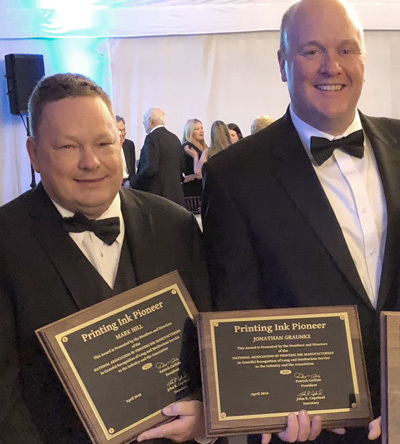 Both men were honored earlier this year with NAPIM Printing Ink Pioneer Awards. Hill’s new job returns him to INX’s Research & Development facility in West Chicago, Illinois. Most recently the Vice President of Liquid Technology and Assistant Research & Development Director, he also served as General Manager of the Appleton, Wisconsin facility from 2012 to April 2017. Hill’s first job in the industry was with Acme Printing Ink in Appleton in 1991. Graunke joined INX in 1992, six months before completing his college studies. Well respected by his peers at INX and throughout the industry, he was honored in 2010 with a NPIRI Technical Achievement award. The next year, Graunke was promoted to Vice President of R&D, Director of Energy Curable Systems. INX International Ink Co. is the third largest producer of inks in North America, with full service subsidiaries in Europe and South America and is part of Sakata INX worldwide operations. We offer a complete line of ink and coating solutions technology for commercial, packaging and digital applications. As a leading global manufacturer of inkjet inks, we provide a full palette of digital ink systems, advanced technologies and integrated services. To stay in touch with the latest developments, follow INX on Facebook and Twitter and visit www.inxinternational.com.